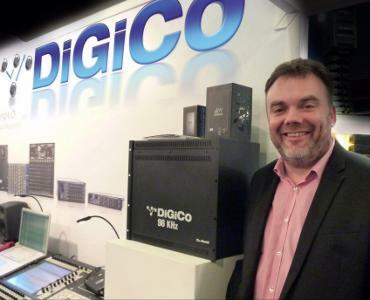 At ISE 2014, UK digital solutions manufacturer DiGiCo introduced its D2-Rack which is designed to support and expand DiGiCo’s SD Range’s higher sample rate I/O solutions. The D2-Rack also will be highlighted at Prolight + Sound show 2014, Frankfurt, Hall 8F60. The D2-Rack comes with either BNC or CAT5 MADI connections, allowing it to be used with a number of DiGiCo consoles or as a stand-alone unit. By using the latest convertors found in DiGiCo’s SD Range, the D2-Rack offers a more compact, more efficient, more affordable rack solution for connection at either 48kHz or 96kHz sampling rate with no I/O reduction. The D2-Rack offers two I/O versions. Customers can choose 48 microphone inputs, 16 line outputs along with two blank output slots allowing an additional 16 outputs in the owners desired format (analogue, AES, Aviom) or a version 24 microphone inputs, 24 AES inputs plus 16 line outputs and two blank output slots. The D2 Rack is currently available for use with SD8 and SD9 systems. The D2-Rack updates an SD8 system with a 96kHz rack option. This allows the user to take advantage of the recent increases in the SD8's Stealth Digital Processing with a no compromise approach to 96kHz. A new system will be introduced that includes the SD8 surface with the D2-Rack with a system price advantage. Following on from the SD9 Rack Pack system DiGiCo launches the SD9 D2-Rack system which will be available with either rack option and will provide a more cost effective single rack solution.